1st Degree (Dan) Black Belt Graduation..way back in 1996. "Lady Bouncer" (front row, seated, fourth from left) Are you still in the "Game?". The black belts are sitting on the right & left hand side of Sabum Sin Jae Sop (7th Dan) and his wife Sabum Madam Cha Son Yong ( 6th Dan). 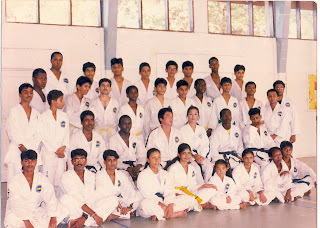 18 went in, only 4 came out with black belts...Duuh..Aiseeh..